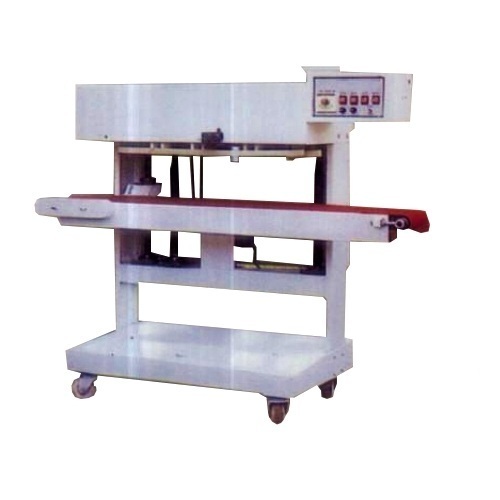 Our company has achieved expertise in manufacturing Band Sealer Machines which have accepted in the Indian as well international market for their robust construction and performance level. These machines provide sealing solutions with speed and perfection. We are providing these machines in several technical specifications. Our company is dedicatedly working towards manufacturing various models of Pouch Packaging Machines. We have the ability to design and build a variety of pouch packaging machines, from the most complex ones to regular models. Our manufacturing capabilities enable us to design, develop and market many models of Pouch Packaging Machines. The range of our product is quite wide, which includes: Four Side Sealing Machine, F.F.S Four Side Sealing Machine, F.F.S. Center Sealing Machine, Band Sealer Machine, Auger Filler Machine, Collar Type with Auger Filling Machine, Liquid Filling Machine and others. These machines are used for packaging of various products such as Tea, Tobacco, Pulses, Rice, Dry Fruits, Namkeens, Sugar, Milk Powder, Detergent Powder, Pesticides and others. With the help of our sound infrastructure, supported by latest machines and in-house design unit we are capable of manufacturing these machines with new and latest features and designs. The entire products range is quite wide and checked for its quality before delivery. Being a client centric organization we have always cared for them. We ensure a high quality of service and customized solutions to them. Further we can also package the consignment as per their requirement at industry leading prices.